A winter virus gave me “a space”, Sanctuary, to read this book from beginning to end. Prior to this I had dipped in and out of it and had thoroughly enjoyed titbits and contemplating the photographs. But this big book of 226 pages and 172 references is a rich, deep, satisfying and stimulating read. It was a decade in the writing and covers much of the author’s life experiences. 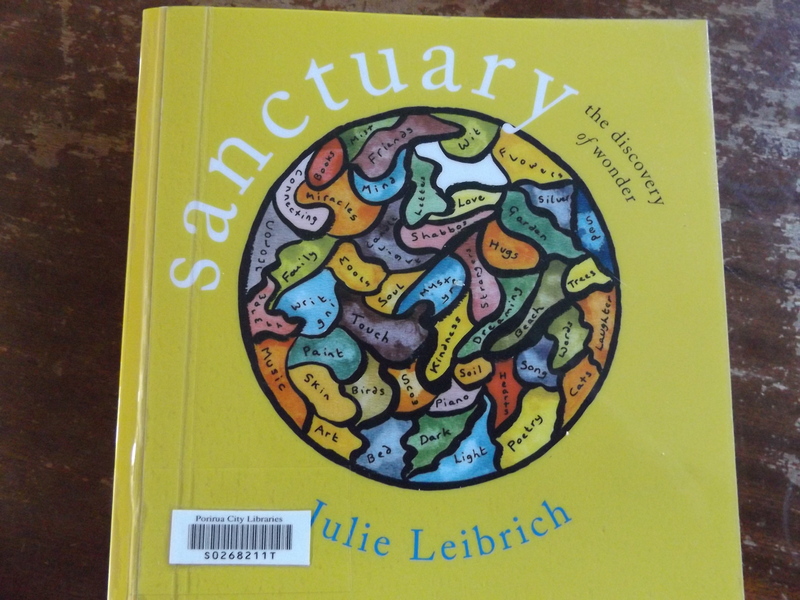 It is a well ordered book that circles from the first section: “Wondering about Sanctuary”, to “Illuminating Sanctuary”, to “Protecting Sanctuary” to “Wonderment of Sanctuary”. 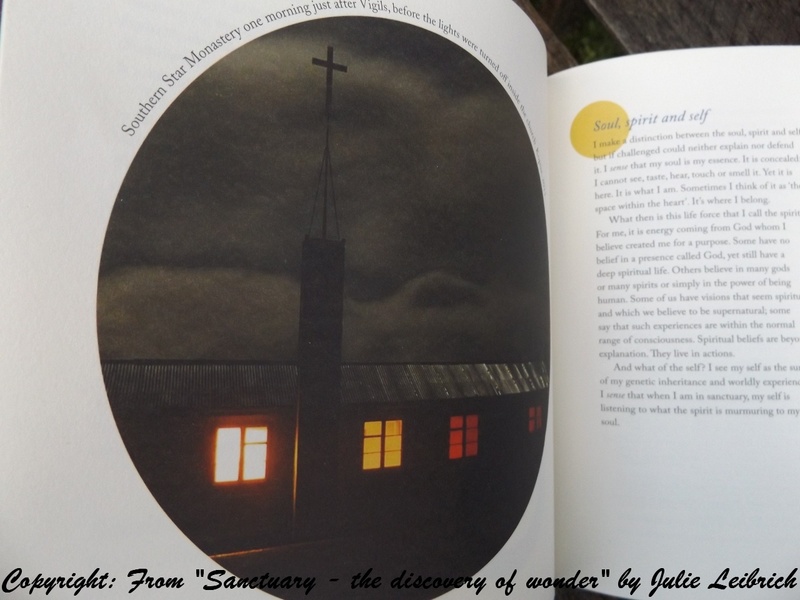 I doubt there was a page in Julie’s book where I was not drawn in, encouraged to wonder, to absorb or marvel or question. Her home on the Kapiti Coast is where my newly widowed mother sought sanctuary, in her new home and environment for the remaining 15 years of her life. 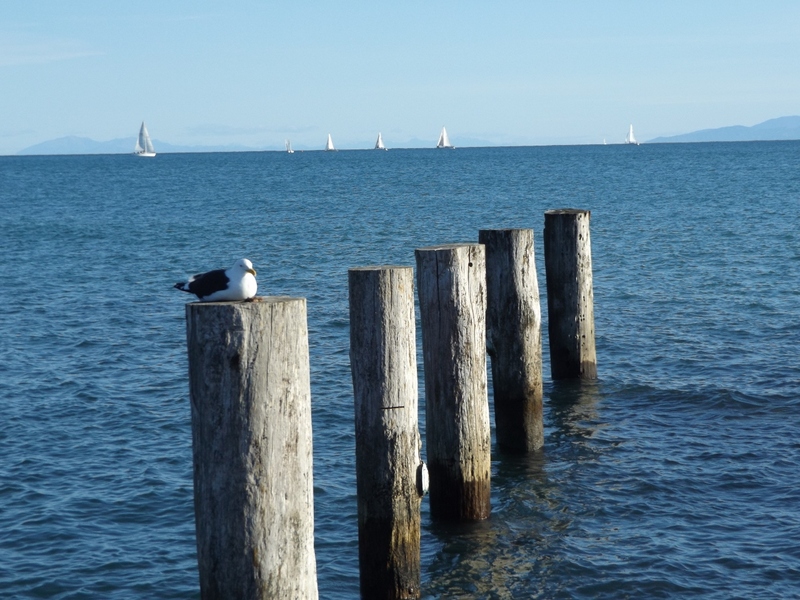 The beach, the sea, the birds, the sky and the looming guardian of Kapiti Island are strong links to me and my understanding of this special environment. The section of Julie’s book where she writes about a poetry course she ran for people suffering from the effects of stroke, Alzheimers and Parkinson’s disease, I found particularly poignant. No matter our age or physical condition, our soul remains a sanctuary. Not only did I find this immensely reassuring but also a wonderful example of compassion. To take time, to give careful attention to detail and to offer attentive presence, gave rise to illuminations from these peoples’ spirits. The book is full of detail, research, images, references, journal entries, poetry, anecdotes, peoples’ thoughts and experiences. Julie’s writing skills are exemplified in her in-depth exploration of words, concepts, beliefs and experiences. The thoughts and contributions of Julie’s friends and acquaintances sit easily among those of influential writers and thinkers across the ages. Sanctuary is not the domain of the highly trained, specialised or profoundly learned and wise; it is for every one of us as human beings. Sanctuary (from the Latin “Sanctus” meaning Holy) can be found anywhere and in limitless ways. It is not limited or definitively prescribed. As the title “the discovery of wonder” indicates – discover what works for you, what gives you inner space. The cover of the book is a contemplation on this very issue. I found this book to be one I want to own so that I can return to it again and again for my own personal and spiritual understanding and development. This entry was posted in Uncategorized and tagged "Sanctuary. 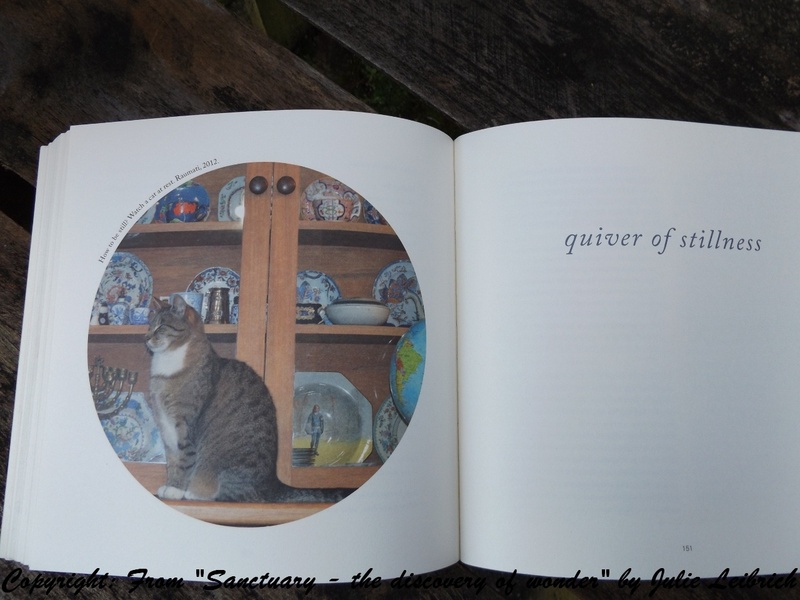 the discovery of wonder" by Julie Leibrich, authors, Books, contemplation, contemplative photography, Discovery, images, journal writing, Julie Leibrich, Kapiti Coast, Kapiti Island, Kopua Monastery, mental health, New Zealand authors, photography, poetry, sanctuary, seasons, spiritual, wonder, words on August 21, 2015 by ordinarygood. Yesterday there were plenty of Tui visiting the garden and singing in good voice. The weather was pleasantly dry and calm and out I went with my camera. My intention was to record a single Tui singing and upload that to You Tube which means readers of my blog can access this special bird and its marvellous song. The first video clip here shows a Tui in their favourite Tulip Magnolia tree which is very close to the sugar water feeders. I was fortunate to find a Tui on a branch relatively close to me and easily seen. I pressed record but realised that, in fact, there were at least two other Tui singing in the same tree as well as another across the road in the Pohutukawa tree. At one point in the video you can see my singer pause, listen to the song of another bird and then begin her/his tune again. 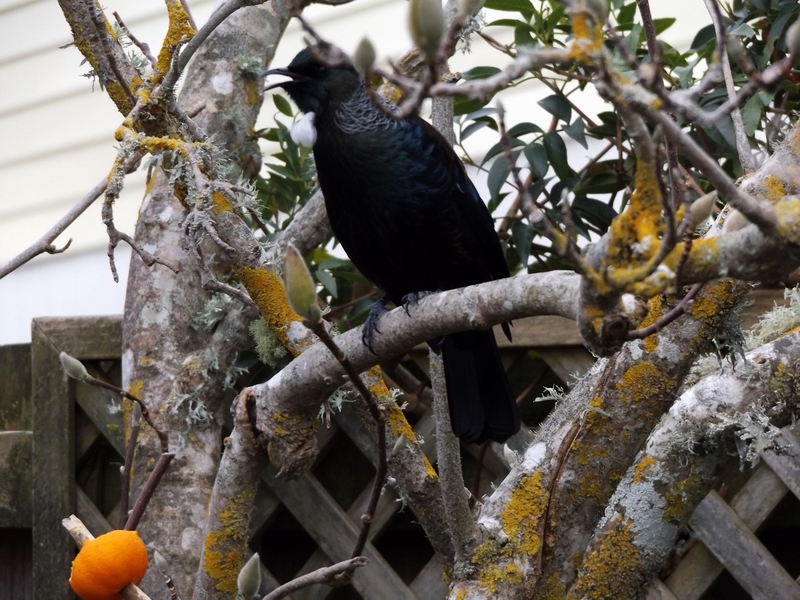 Luck was even more on my side later in the day when I spied a Tui in the deciduous Magnolia we have in our garden. I have been securing pieces of fruit on a few branches of this tree to attract the Tauhou(Silvereyes) to feed. Tui are always curious about red or orange objects and this one I suspect had been to check out the half orange. This Tui (You tube clip here)sings a very familiar song to me indicating that she/he has been visiting the garden for more than a year. The floor was hers/his and even with a minor embarrassment part way through the recital, the performance went on in true theatrical fashion. I hope you enjoy hearing some of the remarkable notes and sounds these birds can make with their double voice box. If you think you are seeing the bird’s beak move at times but can hear nothing that is also possible as some of their notes can be beyond our human hearing range. I never grow tired of hearing these delightful birds singing long and often. This entry was posted in Uncategorized and tagged bird song, birds, New Zealand birds, New Zealand native birds, photography, Tui, video clips, You Tube on August 15, 2015 by ordinarygood. It is busy in the garden with large numbers of Tui and Tauhou seeking food. It has been bitterly cold for a week, although it has been a little warmer over the past 48 hours. So the birds are working very hard to maintain their nutrient levels and strength. 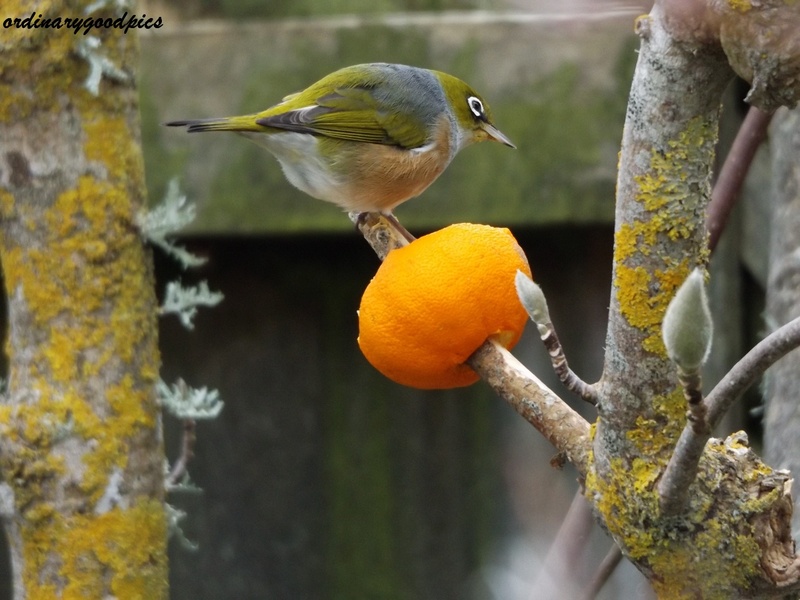 This entry was posted in Uncategorized and tagged bird food, New Zealand birds, oranges, photography, Silvereye, sugar water feeder, Tauhou, Tui, waxeye, Winter on August 14, 2015 by ordinarygood. 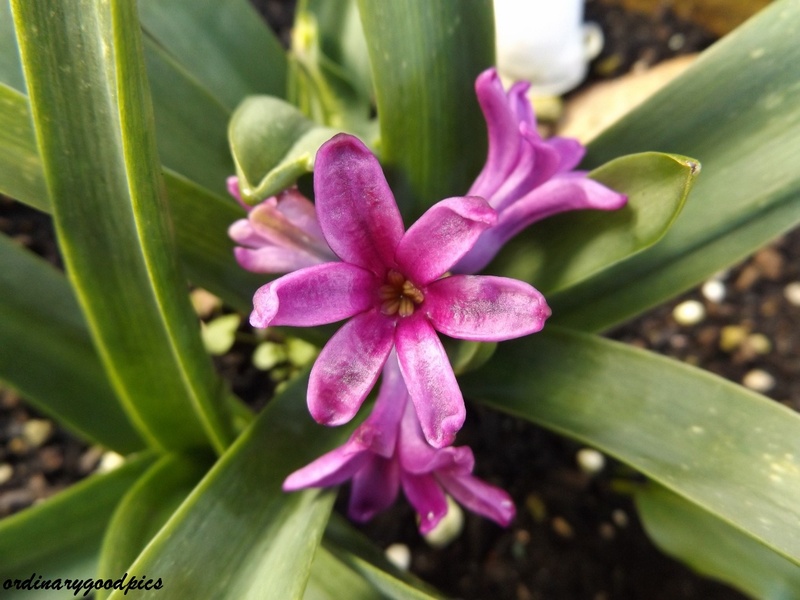 My hyacinths struggling to flower fully. 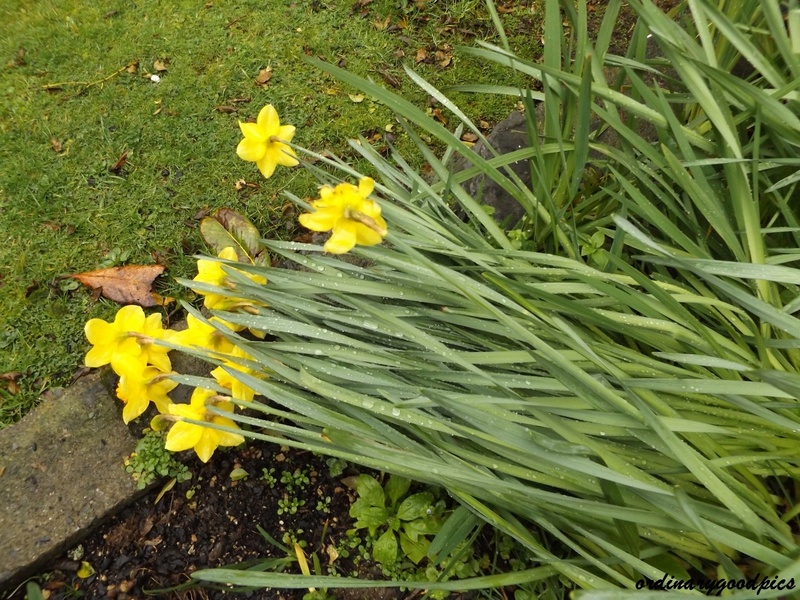 It has been a harsh winter with more tough weather forecast for the next few days. 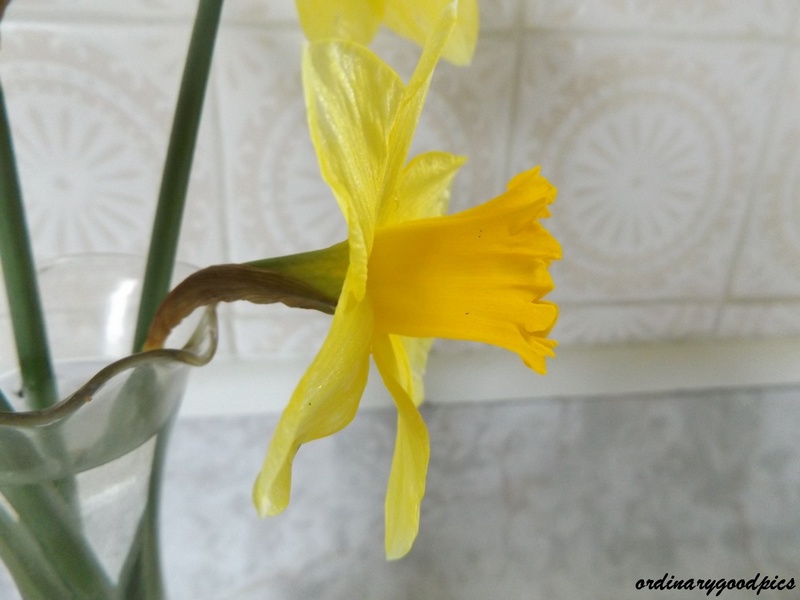 They are another glimpse of spring sometime in the future. This entry was posted in Uncategorized and tagged bulbs, flowers, gardens, Hyacinths, macro photography, nature on August 7, 2015 by ordinarygood. 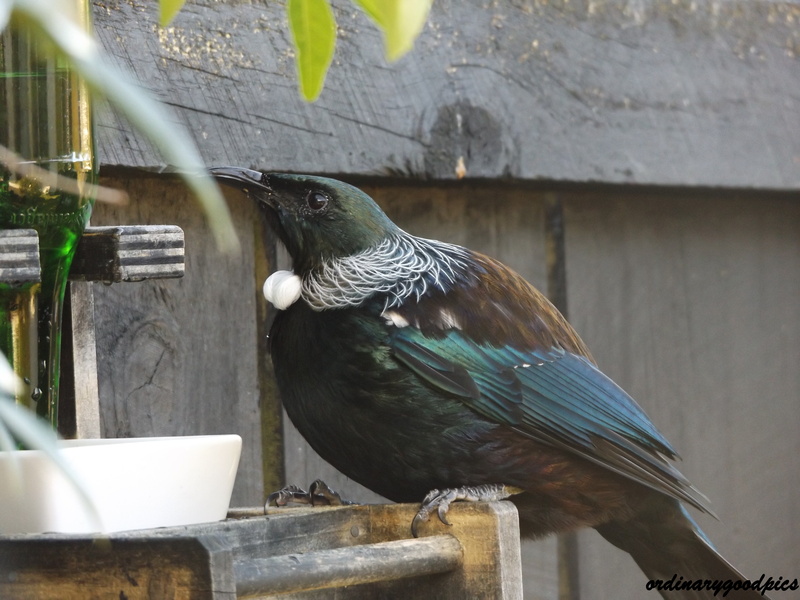 Finally I have set time aside to upload a video clip of Tuis visiting the sugar water feeders in my garden last November (2014). 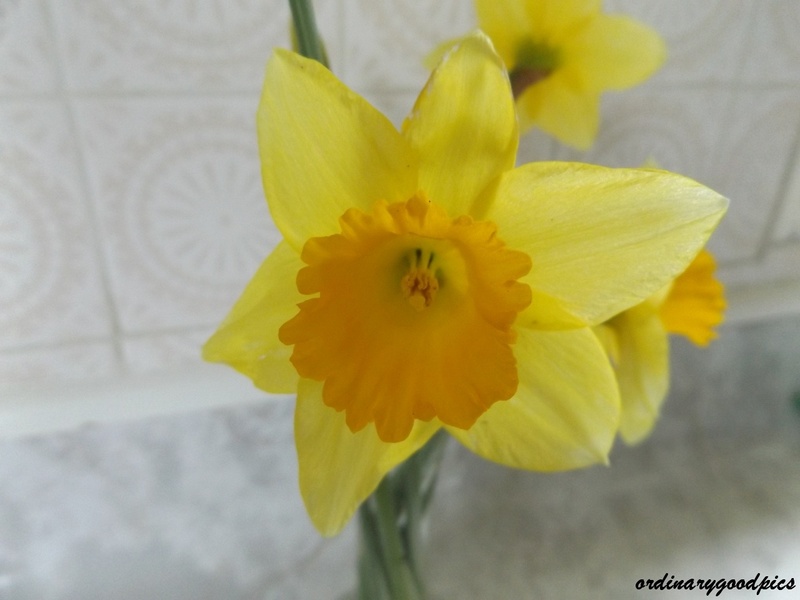 It is my first You Tube upload and seemed simple enough thank goodness. To get the best effect from the You Tube clip click this link here: , turn the sound up on your device and enjoy the songs of the Tui (they have a double voice box which means they can make a large range of fluting notes, through to gurgles and croaks). All the louder bird song/sounds on this clip are those of Tui. I hope you can also hear the rustling sounds of their wings. I have blogged about Tui many times here on my blog and they continue to bring me endless delight as they visit the garden. During the next breeding season I will be on the look-out for visiting fledglings and I plan to video those charming youngsters. 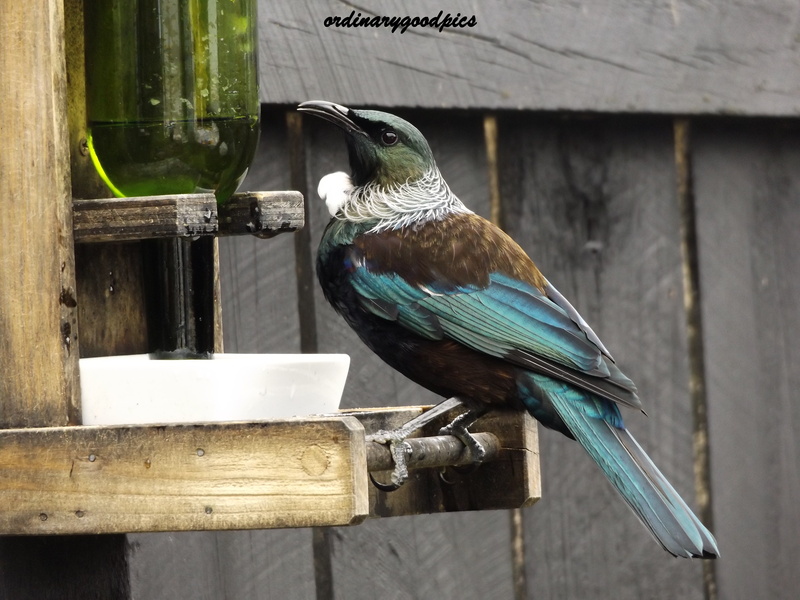 This entry was posted in Uncategorized and tagged nectar feeders, New Zealand native birds, photography, sugar water feeders, Tuis, You Tube videos on August 6, 2015 by ordinarygood. This entry was posted in Uncategorized and tagged Karehana Bay, photography, Porirua, sea, seagull, Winter, yachts on August 2, 2015 by ordinarygood.